Pioneering video monitor maker SmallHD announces it has recovered from a devastating fire at its Cary, NC manufacturing plant and headquarters. The fire occurred April 26 at 7pm, two weeks after the company returned from a successful NAB show. SmallHD personnel working late were the first to call in that blaze that burned though and adjacent suite in the complex. Though flames from the inferno never reached the SmallHD space itself, extreme heat and dense smoke damaged the building structure, electrical system and much of the electrical component inventory ready to be assembled into finished products. No one was harmed. “Once we knew everyone was safe, our primary goal has been to get up and running again as fast as we could,” says Wes Phillips, SmallHD co-founder. 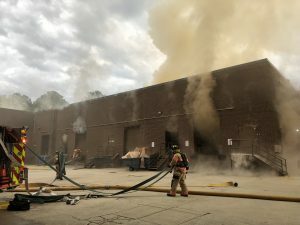 The building had to be emptied, and millions of dollars of inventory thrown away due to smoke and soot damage. Some replacement components took up to 14 weeks to arrive from the time they were re-ordered. “The thing I’ve been most thankful for is our staff and how they’ve stepped up and gotten us back to shipping product.” Backorders on newly introduced FOCUS RX and TX wireless and OLED monitors as well as other products are now being filled. Founded in 2009, SmallHD has made a name as the leading innovator of on-camera monitoring solutions for professional cinematographers, videographers, and photographers worldwide. Creators of the world’s first high definition on-camera monitor, SmallHD continues to push the envelope of what’s possible in an on-camera, studio and production displays by combining advanced cutting-edge technology with accessible pricing.